Norwich Airfield was situated where Heartsease Estate is now. The first to fly here was B.C. Hucks in a Bleriot monoplane. Boulton and Paul's J.D. 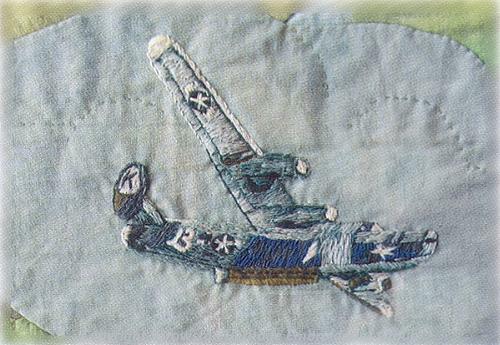 North designed the first aircraft in 1917. Their factory, which became Barnards in 1936, produced many Norwich City works. Besides making miniature trains, for which test tracks were laid alongside Gurney Road, its buildings acted as a decoy in WWII to divert German bombers from the St Faiths airfields. It also monitored test bombs in Mousehold, an excellent lookout for plane spotting. Sprowston Hall had acted as a hospital for wounded in World War One. In World War Two (1939 to 1945), it was the HQ of the GOC Eastern Command and on the eve of D-Day Montgomery addressed several thousand troops - the whole of the Eastern Division, including Canadians, where golf is now played. 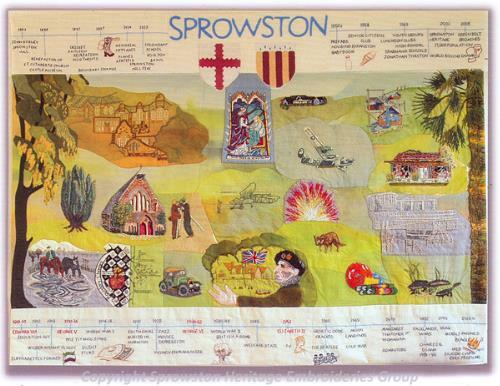 The tapestry also features a Bronze Age cemetery, St Mary and St Margaret's Church, Sprowston Mill, the legend of White Woman Lane, Sprowston Hall and St Cuthbert's Church.